This is the first time in my ‘100 words’ series when I’ve reviewed a book I started but failed to finish. That’s because normally it’s my fault, I’ve simply been distracted by the shiny-shiny novelty of the new. But this time I blame the author. 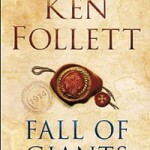 It’s a shame because I loved Follett’s The Pillars of the Earth, a fantastic doorstop of an historical saga which makes you care not only about the large cast of characters but also about the geometry of C.12th Gothic cathedrals. It’s a fantastic achievement, a book which for once merits that made-up blurb-word, ‘unputdownable’. Its sequel, World Without End, lacks the thrilling tension of the first, but is still ideal holiday escapism. 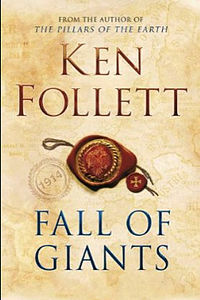 Which brings me to Fall of Giants… I’d hoped for a C.20th equivalent of Pillars, with gripping plots, sympathetic characters, historical insight. Alas. Instead, there is a troupe of cliched, sub-Downton cut-outs, combined with Follett’s wish to beat readers over the head with the (full) names of (the many) acts of Parliament that improved the dire working conditions in mines. Perhaps it’s no worse-written than his other books, perhaps it’s simply that the events that are its backdrop are better known, and as a reader I’m looking for the sense of surprise I found in his middle ages epics. If it were 500 pages shorter I’d have persevered, but sorry, Ken, I’d rather re-read Pillars instead.